Scotland’s Ahmadiyya Muslim community has launched a campaign promoting “peace, love and unity” following the death of Glasgow shop keeper Asad Shah. 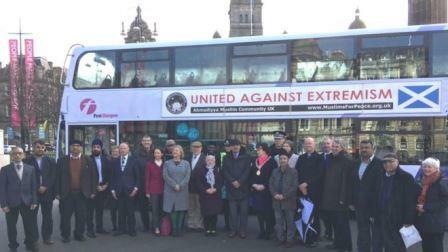 The message “united against extremism” will be carried on posters on 50 buses.Mr Shah was an Ahmadiyya, a group known for its peaceful interfaith concerns.He died after an attack outside his shop on 24 March. Murder accused Tanveer Ahmed, 32, from Bradford, later said he killed the 40-year-old as he had falsely claimed to be a prophet.Politicians and police joined with different community and faith groups, including Christian, Jewish and Sikh, for the launch of the campaign in Glasgow. Mr Abid said Mr Shah had donated money for a previous bus campaign raising awareness of the Ahmadiyya community, an Islamic sect which moved its headquarters to the UK after a law in Pakistan banned its members from identifying themselves as Muslims and calling their places of worship mosques.Paul Morron, president of the Glasgow Jewish Representative Council, is also backing the campaign. Mr Shah, who had moved from Pakistan to Glasgow almost 20 years ago, was found with serious injuries outside his shop on Minard Road, in Glasgow’s Shawlands area on 24 March. He was pronounced dead in hospital.The shop keeper was killed just hours after he posted an Easter message on Facebook to his customers.The message said: “Good Friday and a very happy Easter, especially to my beloved Christian nationx”. During the police investigation officers claimed the incident was “religiously prejudiced” and confirmed both men were Muslims.Mr Ahmed has been charged with murder and made two court appearances where he made no plea and was remanded in custody. Share the post "Ahmadiyya Muslims launch peace campaign in Glasgow"